If you are a fan of Marvel films like I am, the best thing that could have happened for the cinematic universe was the success of stories that might be deemed "risky" due to focusing on unproven commodities. Technically you could say that it started unproven of course, because no one could have known with Iron Man was released in May of 2008 that it would become the dominant interconnected beast it is today, but that's a given. What mattered most was when studio chief Kevin Feige was willing to finance films like Guardians of the Galaxy and Ant-Man. When those movies took off and won over audiences, it was safe to assume the universe would continue to expand and introduce us to new and fascinating characters. Doctor Strange fits that bill, telling the story of Dr. Stephen Strange, an arrogant and egotistical neurosurgeon who has achieved far more acclaim and recognition than a typical member of his field. One night he is driving far too fast and erratically and violently crashes his car, losing the ability to use his hands in the process. It's a devastating turn of events for a man whose entire life resides in what he is able to do with his hands, and during his recovery he battles both depression and a far too ambitious drive to regain full functionality again via experimental treatments. When progress isn't progressing fast enough for his liking, Strange learns of a man named Jonathon Pangborn who never should have been able to walk again until he did. Not only walk, but live a completely normal, healthy life. When Strange locates him, Pangborn points him to a place called Kamar-Taj, and when the doctor arrives there his life changes in mysterious and mystical ways. I started the review by speaking to fans of Marvel films. Going the other direction, if you are typically not interested in what these movies have to offer, you likely won't be again here aside from some truly stunning visual effects that are sometimes absent from the drab palettes of previous MCU fare. In my world the ambitious concepts and execution of these visuals and the directions this film goes in terms of alternate dimensions and portals and magic are worth the price of admission alone, but for many others the standard superhero origin story feel to the plotting could be a chore. As a fan, I never mind these solo efforts that lead into the connected and expansive character world because I have read enough of the comics now to be curious as to whether they will use the same beats or go in an original direction. Some decry the origin portion of these films, I actually was concerned during the first act of Doctor Strange that there wasn't enough of it to really build the character. His aforementioned arrogance and narrow focus on only his career in life is crucial in order to understand the depths of his struggle and drive during his recovery, and I felt like I had barely taken my seat by the time he crashed his car. Even though I knew enough about Stephen Strange prior to even entering the theater, I didn't feel like we knew enough as an audience. However, the screenplay did a good job of incorporating some of that development into the sequences when he is fighting for normalcy in his hands to no avail again as we see him tear down those closest to him, like fellow surgeon Christine Palmer (Rachel McAdams) who begs him to see the value in his life even without his job. He won't consider it and becomes cruel, pushing her away. The action sequences throughout Doctor Strange are solid and entertaining but nothing hit me quite as hard as what we saw in the Captain America films directed by the Russo brothers, The Winter Soldier and Civil War. This isn't much of a criticism though as I would hope that different filmmakers with differing visions of characters wouldn't feel redundant in terms of style from film to film. One area that Marvel seems to really miss the mark on, time and time again, are their villains and unfortunately that's basically the case again in Doctor Strange. I had lofty expectations with the casting of the excellent Mads Mikkelsen in the role of Kaecilius, and he is fine but nothing especially memorable in the grand scheme of the cinematic universe. Despite some issues, Doctor Strange is another entry into the Marvel world that flat out works. Benedict Cumberbatch was the absolute perfect choice to play the Sorcerer Supreme, exemplifying the arrogance and the drive to be able to withstand the injuries and the subsequent training that would help repair his body and mind. 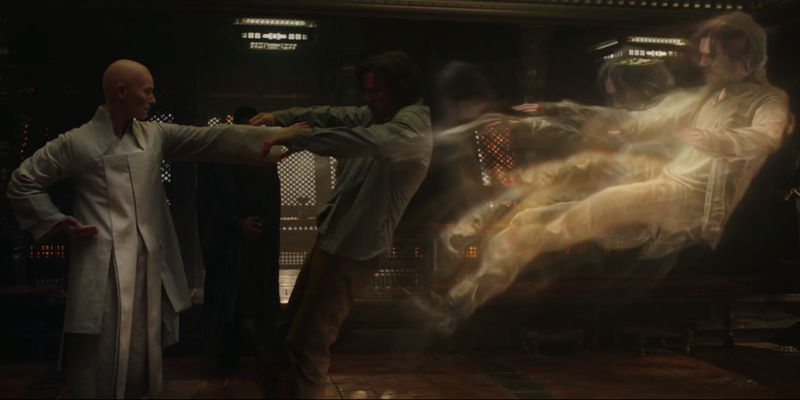 Director Scott Derrickson along with co-writers Jon Spaihts and C. Robert Cargill bring that sense of fun and adventure to this tale, and to see the magic and dimension bending movements on screen is wondrous and hypnotic. Perhaps I am just a sucker who has fallen in line to the trappings of what Feige and the others in charge of Marvel Studios want from their loyal audience, to simply buy their brand with enthusiasm with each passing entry rather than begin to feel fatigued over their seemingly never-ending slate, but I am in. They've got me, and I stick around for the post credit scenes ready to see what direction we might go in next every single time. Doctor Strange is another winner and I look forward to seeing him brought in with the team for the next Avengers entry and, of course, the eventual solo sequel that is clearly destined to be made. Great review! Doctor Strange is the first Marvel film that I actually enjoyed watching and was enthralled with in quite some time. I found his character to be quite refreshing and a much needed addition to the MCU. Thanks Cody! Going to check out your review now! Glad you enjoyed the film and yeah, I am really excited to see Strange mixed in with the rest of the Avengers going forward. A really solid addition to this film universe.